As European Distributor of MOLTOX® we offer a portfolio of bacteriological cell culture media, agar plates, reagents and buffers. The media applications are manufactured for bacterial growth promotion and detection of a variety of bacteria strains. The portfolio has been utilized in INDUSTRIAL (Pharma, Cosmetics, Food, Beverage), ENVIROMENTAL and MOLECULAR microbiology. 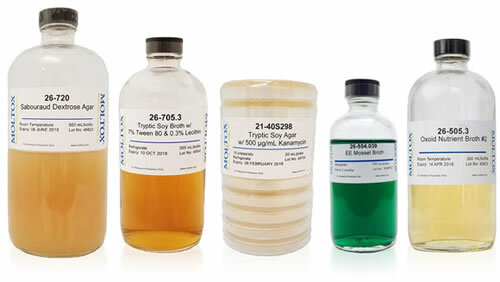 Nutrient, selective and enrichment media for a variety of bacterial strains. Various nutrient and selective agar plates and multi-section plates are included in the portfolio. Customized media are formulated and packaged to your specification. Please contact us, if you need media with non-standard sugars, buffers or special mixtures!